In the first part of this series about the Spanish immersion education boom in West Michigan, we talk about how 6 of the 31 programs in the region are serving a small proportion of local Latino students who are English learners. In particular, we look at two public schools with dual language programs in Holland and Grand Rapids, where kids who fall into this category are able to access their legal right to an equal opportunity education via a model proven to improve their academic outcomes in English, all while helping them maintain their home language. The second part looks at the other 25 programs in the area, wich are designed to help students who already speak English to acquire Spanish. In a region where the vast majority of Latino English learner students are being educated in monolingual settings where the chances of them achieving advanced levels of bilingualism and biliteracy are quite low, 4 out of 5 seats in Spanish immersion classrooms are reserved for a group of kids that are solidly on their way to the elite class, as it is. The first episode of this series is in Spanish and the second one is in English. Both are complementary parts of one single story, not translations of the same content. Start here with part one, and click here to explore the data that I collected for this series. 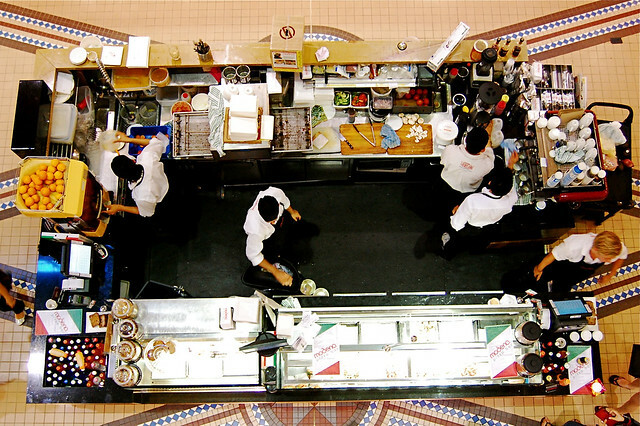 Several months ago, I wrote about the linguistic phenomenon known as Kitchen Spanish. I wanted to dig a little deeper, so I pitched a segment to the podcast, Racist Sandwich, and they were up for it! My own podcast, Tertulia, is in Spanish, so this is my first reported audio story in (mostly) English. 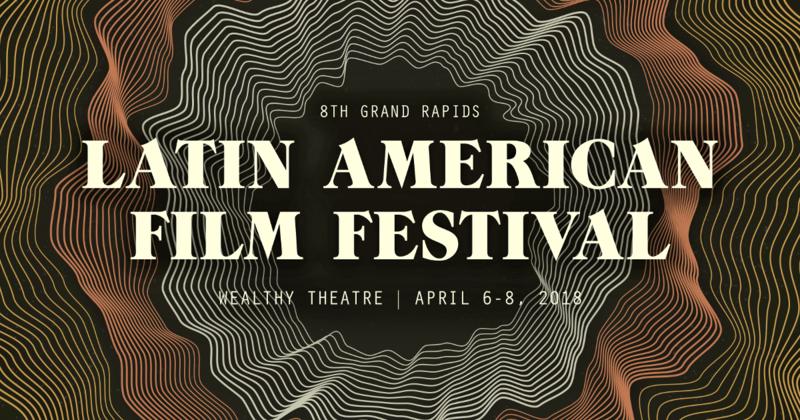 In the piece you’ll hear interviews with staff from restaurants here in Grand Rapids, Michigan, including Donkey Taquería and MeXo (which is slated to open on April 17, 2018). 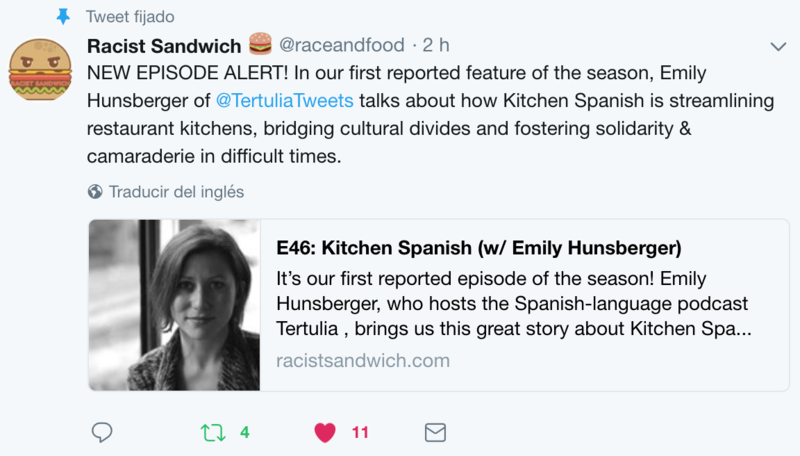 Listen to the Racist Sandwich episode “Kitchen Spanish” here. In my efforts to do a little anthropological desk research, I perused some threads on Reddit and cheftalk.com where both gringo and Latino cooks debate whether Kitchen Spanish is a necessary evil or a delightful cultural experience, as well as share their capsule lists of the most essential vocabulary for the uninitiated (e.g. this and this). One Reddit user who claims to be originally from Buenos Aires describes Kitchen Spanish as “a combination of English, Spanish, and Mexican cuss words” that can’t be learned in any classroom or with the help of any book. This is a belief that may not be held by the more mainstream corners of the internet. I found several conversational Spanish primers for managers in the hospitality industry on Amazon. Most of the authors of those books did not seem to have websites or blogs, which was disappointing as I wanted to read what they had to say about Kitchen Spanish. I was, however, able to find more information about Matt Casado, a professor emeritus of Northern Arizona University’s School of Hotel & Restaurant Management. A native of Spain, Casado not only authored a number of books but also apparently took great strides to ensure that graduates had a basic knowledge of Spanish in order to communicate with back-of-the-house staff. It does seem that there is a clear distinction between “conversational Spanish for hospitality managers” and Kitchen Spanish. For one, in any industry there’s a line separating how management communicates with employees and how employees communicate with one another. Furthermore, let’s just say that the former is a basic ingredient, and the latter is dressed with many creative accoutrements, depending on the kitchen. Do you have any stories about Kitchen Spanish? Tweet me at @TertuliaTweets. I recently had the privilege to write an article for the podcasting newsletter Bello Collective about the world of podcasting in Spanish. For the article, I interviewed (via email) Carolina Guerrero, CEO of Radio Ambulante, and Patricio Lopardo, of Unión Podcastera. I hope you enjoy it.